Florida police were called early Thursday morning after witnesses made a gruesome discovery of two Tampa teenagers whose bodies were bound together and tossed onto a roadside. According to ABC Action News, Angelia Mangum, 19, and Tjhisha Ball, 18, who were reportedly friends, were found around 1 a.m. A witness told the news station that the two women's bodies were bound together with zip ties. "At first I thought it was one, and then I did a U-turn to see if it was a dead animal," witness Jason Brown told Fox 30 Jax. "That's when we saw that it was one laying on top of another that looked like they were tossed from the overpass." The police believe that because of the bodies' location, they hadn't been there very long. "They were in an area where they would have been noticed, so I think it was fairly recently since they'd been left there," an officer told Fox 30 Jax. A medical examiner has yet to determine the cause of death. 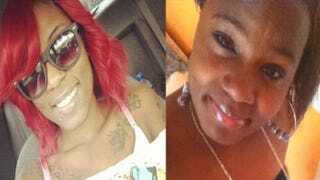 Ball's family told ABC Action News that the two women had been working in Jacksonville as exotic dancers and had been living in the area for a little over a year. "I just don't understand what happened," Ball's sister, Crystal Moore, told the news station. "I feel like sometimes that I failed," Ball's mother, Jerlean Moore, told ABC. "What could I have done? What could I have taught her better? It hurts … it really hurts." No arrests have been made, and police are still piecing together clues in the case. "I just plead with you, whoever done this, please just turn yourself in," Ball's aunt, Permella Hargrove, said through tears. "Anyone that knows anything about these murders, would you please, please help our families to get some justice and some peace." Read more at ABC Action News and Fox 30 Jax.